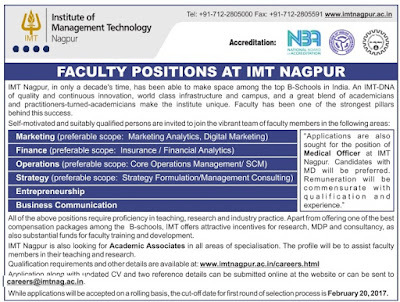 IMT Nagpur invites self motivated and suitable qualified persons to join the vibrant team of Faculty members in the various ares. Application along with the updated CV and two reference details can be submitted online at the website http://www.imtnagpur.ac.in/careers.html or can be sent to careers@imtnag.ac.in. The last date of is 20th February 2017.